"When i walk out to play in Hyderabad I will feel a deep void. A void that can never be filled. 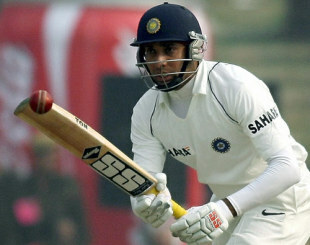 My dear friend, VVS Laxman..."
"The whole team will miss you VVS. One of the best human beings I have ever met in my life. Spent a lot of time with him while batting and fielding and the chat would always be about the team. Personally, I will really miss you Lachu bhai." "The best part about Laxman was his sense of grace on and off the field, both in good times and bad times. I will remember him most for his sense of balance while batting, his ability to keep smiling whatever the situation and the tenacity to keep bouncing back." "That was the brightest day in Laxman's career. That innings had a big impact on Indian cricket. It had given us a huge sense of relief and made us have belief in ourselves that we're not behind... Since then, we never looked back as Indian cricket kept improving." "Laxman has had an outstanding career. He is one of the few batsmen who was a great chaser, an art only a few could master." "Laxman you were amazing [at] cricket everyone knows, but you were surely the best human being I have ever met. God bless you with all the happiness in future." "VVS is one of the finest human beings to have played cricket. One of the main pillars of the team and a true friend. Words are not enough." "From carrying his innings to carrying himself, VVS has shown immense class. Will miss you Laxman bhai." "Laxman bhai has always been an inspiration for all the cricketers. Gonna miss watching him play for India. Wish him all the best for future!" Congrats to VVS Laxman on an amazing career. "Laxman. His attitude is infectious. Felt at peace after talking to him. A salute to him for a great career and inspiring many lives." "Requires a very special man to turn his back on a grandstand end and accept the moment has come. Rose in my eyes if he could any more." "Not many batsmen made batting look as easy as VVS Laxman. If a cricketer's greatness is to be measured in terms of his performances against the best opposition of his time, then Laxman stands right at the top; his record against Australia, the world's No. 1 team for the better part of his career, speaks for itself. Indian cricket-lovers, and the game of cricket itself, will miss him for the elegance and grace that he epitomised, on and off the field."